Facebook is a healthy and interactive medium for social networking. Still, you may come across negative elements or activities on Facebook. Just like you can report abusive photo uploading and sharing on Facebook, there are measures for fake Facebook profiles. 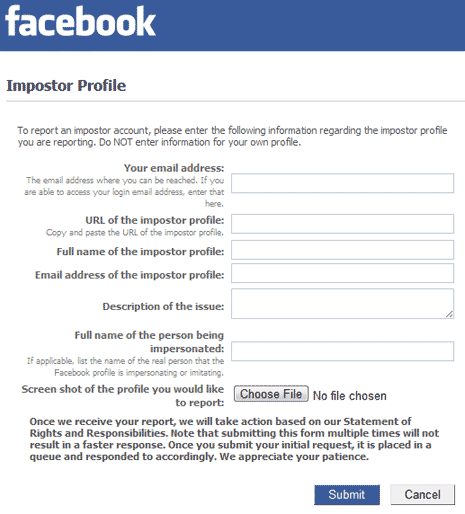 You can easily report an imposter user creating fake Facebook profile for quick action by Facebook team. 1. Open Imposter Profile reporting contact page. You can use this even if you do not have a Facebook account. 2. Enter your email address to allow Facebook team to contact you for the follow-up. 3. Then enter details of imposter or fake profile including: profile url, full name, email address, description, full name of the person being impersonated and screenshot of the profile. 4. Click Submit button and let Facebook team check on reported profile. You should receive email alert for the follow-up action as and when it happens.